Aids digestion and intestinal function. The human body relies on a healthy level of probiotics for numerous functions, including metabolizing foods, absorbing nutrients and maintaining a proper balance of intestinal flora. Probiotic microbes have a symbiotic relationship with their human hosts-both the probiotics and the humans benefit from their relationship. It is estimated that over 400 different types of normal flora inhabit the human gastrointestinal and genitourinary tracts. Studies have shown that children age 1 to 6 years old who attended day care centers and were given milk containing Lactobacillus rhamnosus missed fewer days of day care than children not receiving the probiotic. Studies have also shown that a healthy intestinal bacterial colonization may reduce the risk of food allergies in infants. Researchers have also found that probiotics aid digestion. 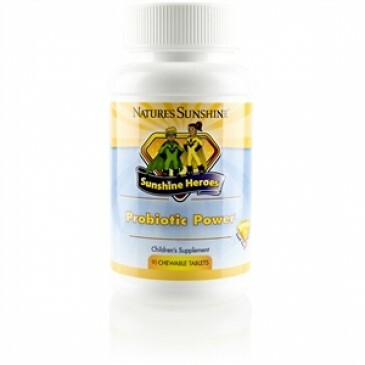 Each chewable tablet of Sunshine Heroes Probiotic Power contains 1 billion friendly cultures from 11 strains of probiotics. Bifidobacterium bifidum, Bifidobacterium infantis, Bifidobacterium longum, Lactobacillus rhamnosus, Lactobacillus acidophilus, Lactobacillus bulgaricus, Lactobacillus brevis, Lactobacillus plantarum, Lactobacillus salivarius, Lactobacillus casei, Streptcoccus thermophilusand the Sunshine Heroes Protector Shield blend. 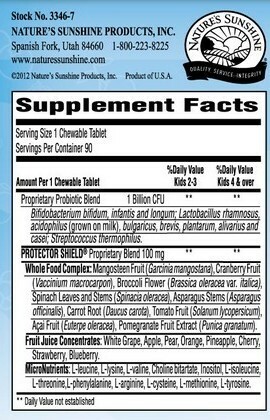 Chew 1 to 2 tablets daily as a dietary supplement. Chew carefully and thoroughly before swallowing.